Self-guided bike tour on the renowned Camino ! The last 15 days from Leon to Santiago de Compostela. The goal of all historic ways to Santiago is the city of Santiago de Compostela in Galicia. And the most famous route of all is the one known as the French Way, which crosses the Pyrenees from France into Spain. The route is brimming with history, legends and art, and boasts a wealth of landscapes and natural settings as diverse as they are unforgettable. During the Middle Ages practically the only way to travel this route was on foot or horseback. The coming of new means of transportation did not change the course of these methods of travelling, except in one case – the bicycle. Arrival in Leon - Overnight Leon ** BB. Minimum elevation 800 m – maximum elevation 950 m.
The journey to Santiago is through a populated and accessible plain. The last stretch, en route to the Roman city of Astorga, takes us into the region of La Maragateria, famous for its muleteers and deep-rooted traditions.Dinner and night Astorga ** Hotel. 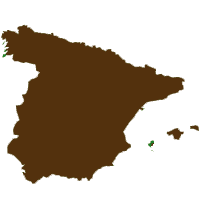 Minimum elevation 500 m – maximum elevation 1504 m.
In the vicinity of Mount Irago, the Bierzo region begins, marking the transition between Leon and Galicia. Here the people, their customs and landscape act as a bridge across the gap that divides the two cultures. On this stretch, the pilgrim must climb Cruz de Ferro 1504m in altitude, one of the highest points along the French Way. Dinner and night Ponferrada ** Hotel. Minimum elevation 460 m – maximum elevation 1320 m.
The Bierzo region and Galicia meet on this stage which culminates at 1300m in O Cebreiro, which is perhaps the most mythical of all villages on this Way, and heavily charged with its symbolism. The first km along this route continue in the same vein, from Villafranca through the narrow valley of the Valcarce river. The last 8 km ascend some 690metres. However the spectacular views of the countryside and the notion that Compostela is drawing nearer compensates for the effort. Dinner and night O Cebreiro (Hospederia). Minimum elevation 450 m – maximum elevation 1330 m.
lush countryside and the Galician mountains dominate this stretch. In Triacastela, the pilgrim can choose to continue along the traditional way or to take the road to Samos, whose great Benedictine Monastery has attracted pilgrims since ancient times.From here, the Way makes its way through inhabited areas, passing through a succession of villages. The stage makes its way up and down hills, although this stretch ascends almost 850m. Dinner and night Sarria ** Hotel. Minimum elevation 360 m – maximum elevation 730 m.
The Way leads out of Sarria through some of the most magnificent oak woods to be found on the entire route, continuing through an endless succession of villages and farmlands. This penultimate part of the route travels through a countryside of rolling hills and short stretches of plains, which, however, does not keep it from being a true “leg breaker” owing to the constantly changing course.Dinner and night Palas de Rei *** Hotel. – Minimum elevation 290 m – maximum elevation 560 m.
At this point, just 70 km from the ultimate goal of Santiago de Compostela, the pilgrims are filled with a sense of expectation which accords them the encouragement they need to tackle this last stretch with renewed strength. Even though the contour of the land does not present any major difficulties on this last stage, the Way travels through village after village, across valleys and rivers …The succession of ascents and descents makes for arduous cycling. On reaching the Monte do Gozo, we have our first glimpse of the towers of the Cathedral of Santiago. From here we go directly into the heart of the city. Night Santiago ** B&B. End of the trip after breakfast. 710 € per person in double room. Departure period : any day between April 1 to October 31. 7 nights in 2 and 3* hotels and hospederias. 5 dinners & 7 breakfasts. 1 guide book including the route and map. Customize your stay : Add or remove one night or more ! Click on "Ask for more information"
Access : Santiago de Compostela airport (transfer to the start of the tour possible). Starts in : Leon, Spain. Ends in : Santiago de Compostela, Spain. Customize your stay : add or remove one night or more ! .More time to enjoy the surroundings. .Easy to take time away from the route. .You can customize your trip !